Somewhat unusually LX were quicker out of the blocks. The midfield of Ballard, Talati & Kiernander supported by the overlapping Mayes prompted some fine attacking moves. The revelation ,however, was the scintillating movement of the twin striking force of Hunt & Jones who were ripping holes in the Oxted defence. A fine interchange of passing by these two terrriers produced an excellent tap-in for Jones to set the pattern for the opening half. Jones then continued his abundant goal-scoring run carried over from Antwerp when he added a second goal to his tally. Meanwhile the LX defence was rarely troubled except by the occasional threat of longs balls well struck by the Oxted defence to their central striker & by occasional sallies into the LX circle from the right which were expertly defended by the ever reliable & well-positioned Money. The second half started even better for LX. A generous push-in from Oxted went straight to the unmarked Talati who ran two-thirds of the length of the pitch ,rounded the goallie & stroked the ball into an empty net.Was 3-0 too good to be true ? Unfortunately the answer was " Yes"! The first reply from Oxted resulted from a second short corner awarded immediately after an infringement from another short corner.As the retreating LX defenders turned their backs to return to behind the goalline Oxted had already taken the short & scored ! A second goal was to follow also in somewhat controversial fashion when Oxted scored from a hit that appeared to some to have been struck outside the circle. These two goals gave great heart to Oxted in spite of some wonderfully intellectual defence from Jackson & some typically resolute stopping from Longden & Read. In the end younger legs prevailed & Oxted scored a well worked & executed equalizing goal to round off an excellent contest between two sporting sides. Mention must be made of Mckee who had a great game in goal & marshalled the LX defence. He was not to blame for any of the Oxted goals. Great credit too must go to the umpires for their contribution to such a fine game. 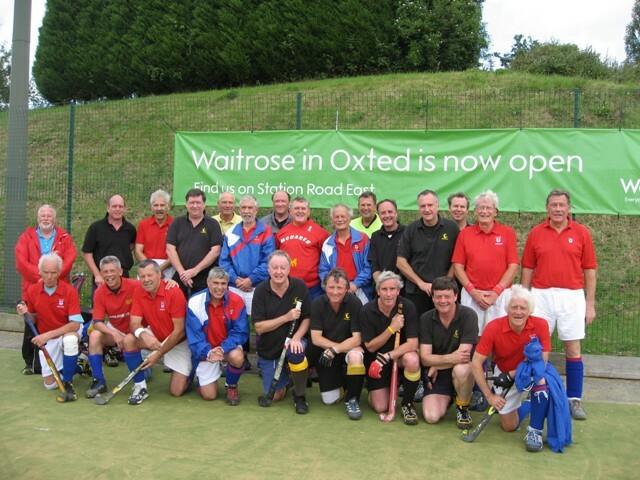 As usual Rainer & his side were excellent post match hosts & hopefully LX will be invited back next year to renew their rivalry on what should by then be a relaid Oxted astro.